Da Nang is a beautiful seaside city attracting visitors. Going to Da Nang to visit famous destinations. You will also have the opportunity to enjoy many special local dishes. 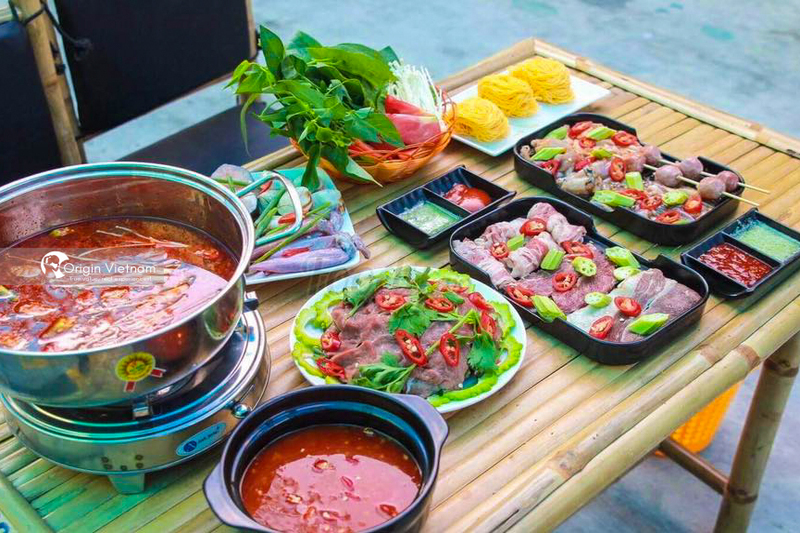 Culinary Danang has countless delicious dishes for visitors to enjoy. But choosing a good place to eat is not easy. If you do not know Where to find the best place and good price food in Da Nang. Please visit Origin Vietnam Travel follow the article below. Below is a list of delicious restaurants in Da Nang that Origin Vietnam Travel has synthesized for visitors to refer. Quang Noodle is a good taste to try when traveling to Da Nang. Quang noodle has many different types. Such as Quang noodle snack noodle, noodle soup crab noodle, eel noodle ... but "traditional" is noodles shrimp, chicken, eggs, meat. Especially, indispensable ingredients in Quang noodle are roasted peanuts and crispy sesame rice cake. Quang noodle is often eaten with vegetables such as cabbage, lettuce, basil, bean sprouts, coriander, coriander, thinly squeezed corn ... 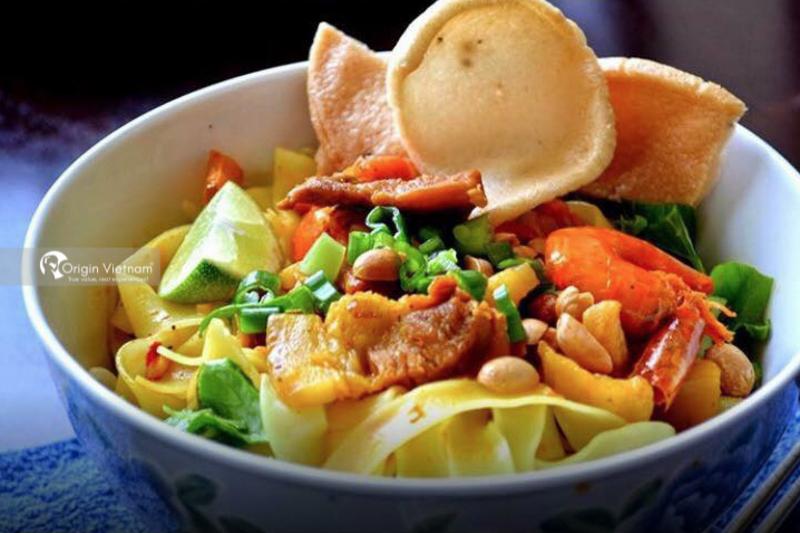 Enjoy the taste of Quang Da Nang noodles once, visitors will not forget the taste. Nam O is a fishing village located at the foot of Hai Van Pass. It's far from Danang more than 10km. In addition to famous for traditional fish sauce, Nam O also known for fish salad. Nam O fish has been a famous specialty of Danang. To make this dish, you can use a variety of fish. Such as sardines, herring, fish or fish. Normally, Nam O people use herring to make salad. Since the herring has fresh meat, tastes delicious, suitable to make this dish. There are two types of Nam O fish: dry and wet. Indulge in salted fish, salted basil, basil, chopped salted fish, cucumber, banana, guava, guava leaves, spider mite ... If you have a chance to travel to Da Nang, Please visit Nam O to enjoy fish salad. Banh xeo is familiar dish of Danang people. The cake is made from ground rice flour with egg yolks and turmeric powder, cast on hot pans. Bread includes tamarind, fresh shrimp and bean sprouts. Vegetables, bananas, chopped bananas, herbs, lettuce, chopped cucumbers ... along with white radish and sour carrots. The most important thing to make a delicious cake is in the sauce. In addition to the cup of sweet and sour sauce mixed in the usual way. Danang also has a cup of soy sauce mixed with pig liver and peanuts to pancakes. Hot cakes, wrapped in thin paper rolls or large leaves are delicious nothing. Piece of cake when put into the mouth, customers also see the medium crisp, add fatty smell, sweet taste of shrimp and meat with fresh vegetables. If you do not know what to eat Da Nang. So pancakes are the right choice for you. Cau Mong is a landmark of Dien Phuong commune, Dien Ban district, Quang Nam province. This place is famous for its famous calves. The beetle from Cau Mong was harvested from calves at 5 months old and harvested by mulberry grass on the Thu Bon River so the meat was fragrant sweet. Delicious red beef, reddish yellow skin. It's look very attractive. When enjoying, diner thin slices of bread, Put the curd on the roll, dots on the fish sauce, delicious taste not described. 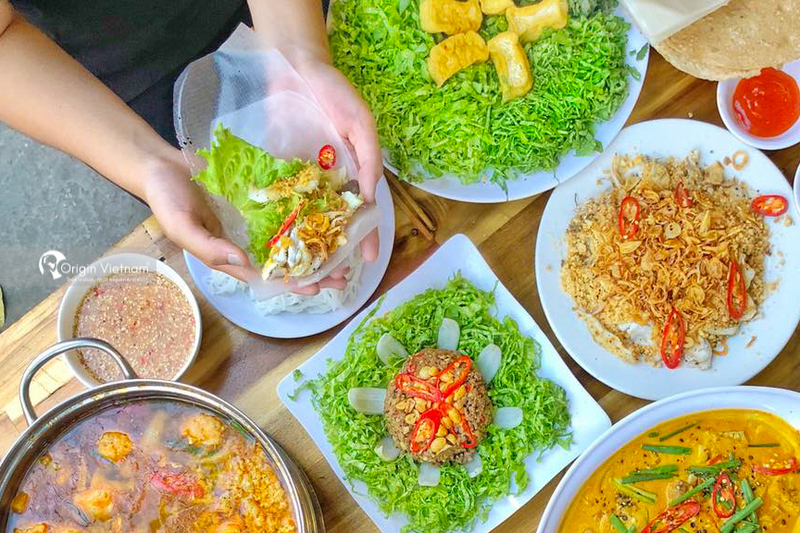 With the famous restaurants in Da Nang Origin Vietnam Travel introduced above, surely you have the answer to the question "Where to find the best place and good price food in Da Nang". 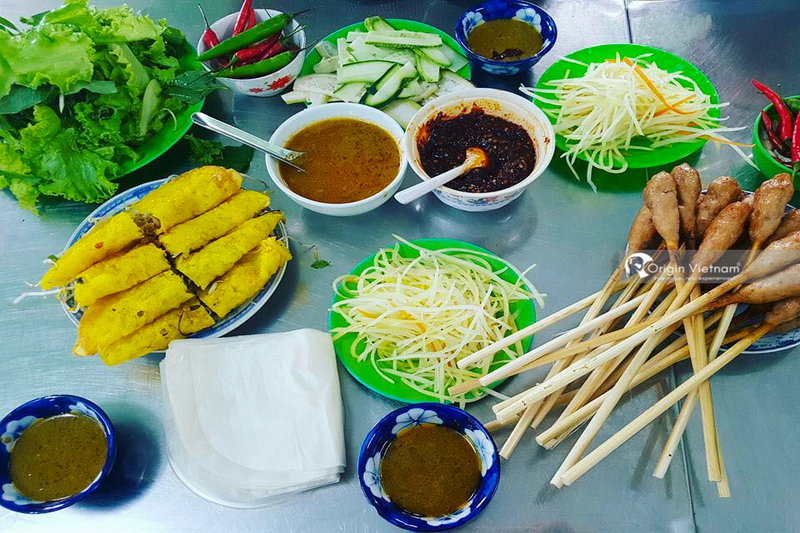 Through this article, hope you will have the right food choice in Da Nang.